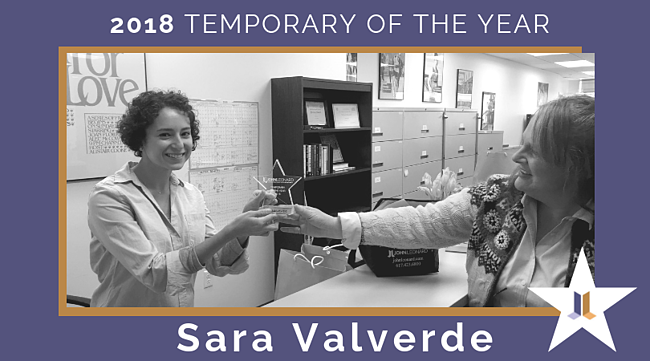 JOHNLEONARD is thrilled to announce Sara Valverde as our 2018 Temporary Staff Representative of the Year. In honor of receiving this award, we presented Sara with a $500 Outstanding Performer bonus to celebrate her remarkable achievement and dedication. Sara has excelled in six assignments over the course of the year, maintaining her professional, enthusiastic attitude. Most of her assignments have lasted a month long and revolved around administrative responsibilities. Employer’s positive feedback about her performance has been consistent. At her most recent assignment, Sara worked as an HR Administrative Coordinator, immediately adding value to the department. Her supportive supervisors noted her contributions, suggestions and undeniable desire to better understand the goals and values of the organization. Described as, “easy to approach” and “extremely personable”, Sara has become an appreciated contributor and was extended a full-time position with the organization! We sincerely thank Sara for all that she has done with JOHNLEOANRD and wish her the best of luck in her new position!